Claire Prescott is a sensible woman who believes in facts and figures, not fairy tales. But when she agrees to present a paper to a summer symposium at Oxford on her ailing sister's behalf, Claire finds herself thrown into an adventure with a gaggle of Jane Austen-loving women all on the lookout for their Mr. Darcy. Claire isn't looking for Mr. Anyone. She's been dating Neil -- a nice if a bit negligent -- sports fanatic. But when a tall, dark and dashing stranger crosses her path, will the staid Claire suddenly discover her inner romantic heroine? Her chance meeting with a mysterious woman who claims to have an early version of Austen's Pride and Prejudice -- in which Lizzie ends up with someone other than Fitzwilliam Darcy -- leads to an astounding discovery about the venerated author's own struggle to find the right hero for Lizzie Bennet. Neil's unexpected arrival in Oxford complicates Claire's journey to finding her own romantic lead. Mr. Darcy Broke My Heart is the story of a woman who finds that love isn't logical and that a true hero can appear in the most unexpected of places. A current giveaway from Maria. Despite only a few surviving personal papers and letters, no autobiographical notes, and no diaries written by Jane Austen, attempts to piece together the life and personality of the author abound. An experienced biographer, Tomalin makes do by focusing more on the Austen family, acquaintances, and friends than on Austen herself, forthrightly acknowledging, "It is only because of her writing that we think them worth remembering; and yet she is at almost every point harder to summon up than any of them...she is as elusive as a cloud in the night sky." Like David Nokes's recent biography, Jane Austen, Tomalin's presents an engaging story of the life and times of the Austen family. 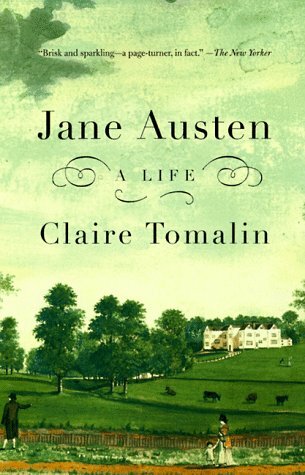 Although Tomalin's biography is not as detailed as Nokes's, it offers a freshness in its attention to, and compassion regarding the child-rearing practices of the Austens, the physical demands on child-bearing women, and to the portrayal of Austen's will, determination, and energy in her final days. Recommended for literature collections for its perspective and minimal speculations. Recommended by Fiona! I need Mr. Darcy Broke My Heart :) & that dress.